Single ladies worldwide might have had their hopes of becoming part of British royalty dashed, when the royal wedding between Prince Harry and American actress Meghan Markle took place over the weekend. 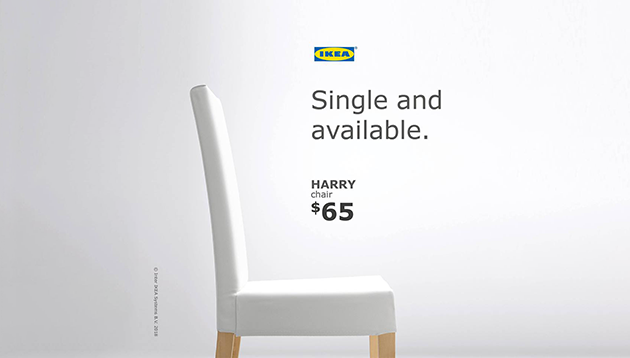 While Prince Harry might be married happily ever after, IKEA wants consumers to know that there is still another Harry out there that is single and available. The brand published a witty social media post featuring its IKEA Harry chair, with the caption “Don’t worry ladies, HARRY isn’t off the market. We promise.” The post received over 10k reactions, 2,527 shares and 553 comments at the time of writing. Netizens were mostly amused by the post, with some praising IKEA for its “brilliant” marketing. In a statement to Marketing, IKEA’s spokesperson said the royal wedding has been a widely talked-about topic in past weeks. As such, the company saw a nice opportunity to make a lighthearted nod towards the well-loved couple, and to let people know that UK’s favourite prince is still up for grabs, at least in the IKEA stores. “We are glad to see that the post has taken well with the community in the markets we look after – Singapore, Malaysia and Thailand,” the spokesperson added. IKEA was not the only brand to have gotten involved with the royal wedding. KFC UK invited members of its loyalty scheme, the Colonel’s Club, to celebrate the royal wedding by redeeming an exclusive, handmade “Kentucky Fine China” bucket (where the bucket is actually made by China). Created by iris London and crafted by Milton China based in central England, the bucket is “truly fit for royalty” as it is made from fine English bone china, the press statement read, adding that there are only 25 pieces available. “With our Colonel’s Club loyalty scheme, we’re always looking to reward our members with unique rewards that go beyond the predictable transactional points scheme – the bone china bucket is a great example of us giving our fans something of real value,” Hazell White, CRM and loyalty manager, KFC UK and Ireland, said. Meanwhile, Dunkin’ Donuts also created a Dunkin’ carriage to match its Royal Love Donut, which were both available until 20 May 2018. Dunkin’ Brands chairman and CEO Nigel Travis said the Royal Wedding represents optimism, happiness and joy, and thus is a perfect opportunity for the brand to celebrate. “We love helping our guests make special occasions both big and small even sweeter with fun donut designs and flavors,” Travis said. Did you come across other brands that jumped on the royal wedding hype? Share with us at janicetan@marketing-interactive.com. Hong Kong property developer District15 has launched a new full brand visual for The Nate - its new living concept promoting an af..